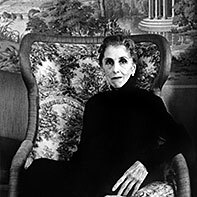 Literary scholars from the University of Copenhagen have compared world-famous Danish author Karen Blixen's Danish and English texts and have found that she left behind two distinctly different literary legacies; passages as well as situations differ widely in the Danish and American editions of her texts. Scholars present the new analyses at a conference in Copenhagen at the 50th anniversary of her death. During the 20th century, Karen Blixen and Isak Dinesen divided the world between themselves: Karen Blixen was the great Danish novelist, while Isak Dinesen was a famous author in the Anglophone world. It was thought that Blixen and Dinesen wrote the same novels – the only difference being that they were written in two different languages. But now Danish scholars from the University of Copenhagen have revealed that this traditional understanding of the Blixen/Dinesen relationship is misguided. "The novels were not translated word for word. Entire passages and situations in the Danish editions have been omitted from the American ones. And the same applies to the few cases where she wrote the novels in Danish first and then translated them into English. Novelist Aldous Huxley was replaced by Danish author and man of letters M.A. Goldschmidt in the Danish edition of Out of Africa, and while she refers to Danish poets Emil Aarestrup and Christian Winther in Winter's Tales, she cannot, for obvious reasons, do the same in the English editions," Professor Poul Behrendt from the University of Copenhagen says. "One of the more peculiar aspects of traditional Blixen scholarship is that it has been divided into two: one that deals with Karen Blixen's authorship and one that deals with Isak Dinesen's. The popular notion has been that the novels essentially are the same and that Winter's Tales and Vinter-Eventyr contain the same text, just in two different languages. Very few scholars have checked whether that really is the case," Professor Behrendt explains. The scholars have identified numerous discrepancies between the Blixen and the Dinesen novels. Karen Blixen always wrote, with one exception, her novels in English first. And when she had completed an English manuscript, she translated it into Danish herself. But very few Danes realise this. "She re-wrote her manuscripts over and over again and added material with each revision, also in the translations." "She is clearly much more knowledgeable about historical writing styles when she writes in Danish, whereas her English style is more concise and to the point. She maintained a 19th century writing style in Danish, which is why many people were shocked when her letters from Africa were published, and it turned out she mastered a completely contemporary Danish when she was not writing fiction," Professor Behrendt points out. The scholar believes that many aspects of Blixen's literature make the author interesting to modern audiences 50 years after her death. "Blixen dared to tell stories that were not confined to realistic settings, and she is a story-teller who does not conform to stylistic conventions. This gives a unique position in Danish literature. Today her style of fiction is not that rare – we are all familiar with the magic realism of South American fiction that has swept the world since the 70's – but Blixen's stories follow a different logic than modern fantastic literature." Karen Blixen (1885-1962) was a Danish author who in the English-speaking world was primarily known under her pen-name Isak Dinesen. She lived in Kenya from 1913-1931, running a coffee plantation, and her novel Out of Africa is an account of that experience. Returning from Africa in 1931, she moved into the family mansion Rungstedlund near Copenhagen, where she spent the rest of her life, writing many of the famous novels such as Seven Gothic Tales, Out of Africa, and Winter's Tales. Scholars will present the new analyses of Karen Blixen's work at the conference Karen Blixen in the 21st century, which takes place at the University of Copenhagen and Rungstedlund from 5-7 September. See the conference programme (in Danish).